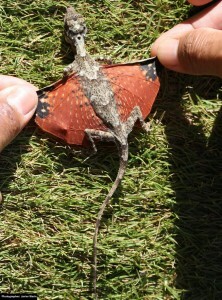 It’s a Bird, It’s a Plane … It’s a flying draco! These gliding dragons, glide far and wide as their method of escaping predators, searching for food, finding mates, and defending their territory. Now you may be wonderingAs for it breathing fire part though, I’ll just have to leave that for your imagination. How exactly do they do it? The secret lies in their “wings”. Unlike other gliding animals, the loose skin that appears under the arms and feet of the animals isn’t just loose skin. In actuality, the skin underneath the arms of the Draco lizard are extended ribs that allow for them to extend and extract their arms in flight for a better glide. “Gliding is defined as descent through the air at an angle of less than 45° to the horizontal, and this mode of locomotion has been achieved through a range of impressive morphological and behavioural adaptations that generate the required aerodynamic forces (upward ‘lift’ exceeding air resistance, or ‘drag’)” (Map of Life). 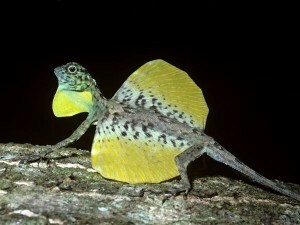 With the use of their “wings” the Draco Lizard descends from the high branches of the rainforest extend their arms, and use their long, slender tails to steer themselves through the air. They have been known the to glide vast distances soaring with the wind, gliding as far as 195 feet across while dropping 30 feet from their initial jump. Good luck catching this little guy! You included a literal quote from a website (Map of Life) but forgot to include it in your list of sources!